What comes to mind when you think of an American athlete? Big strong football players and tall basketball players with long arms? These are some of your “typical” American sports athlete bodies yet no one thinks about golfers fitting into this category. As the Masters have just finished up and Tiger Woods once again stood atop of the golf world, we can look at how he continued to define what the modern golfer is all about. It was Tiger Woods after all that made lifting a thing in golf and strength training for golf a serious business. Golf is a game that requires high levels of skill, but also athletic prowess. Being able to create large amounts of power and maintain specific postures isn’t easy, as anyone who golfs knows! Successful golf demands you get into the correct position to achieve the proper swing plane. Small changes in a players body position or holding position of the club is what helps to determine the trajectory of the ball. Inevitably, golfers will spend thousands of dollars buying or upgrading to new clubs, to try to help them play better. They don’t realize many times that the problem is in their bodies, which is the foundation of your success as a golfer. It is the one and only tool you need to work properly before picking up a club and swinging it over and over and over again. The typical 18 holes take on average 4 hours to play so if you want to play golf for the rest of your life then taking care of your most important piece of equipment (your body) should be top priority. Would you take pride in playing with a cracked shaft or a dented club face? Mobility and strength of the joints will lead to good biomechanics in order to hit the ball. That is why DVRT is so well suited for golfers. Accuracy in your movements is acquired with practice and eventually can become seamless but the Ultimate Sandbag will humble your accuracy. Something many people love and hate about the Ultimate Sandbag is how it will highlight weak areas and compensations rather quickly! Around the Worlds for example are about precise foot movement, keeping the weight close to the body and using the “pulse” of the core to create seamless movement. Some of the most common things I see when it comes to having better swing mechanics is the need for better lateral stability. Many golfers are told by their swing coaches to avoid sway or early extension so you don’t lose yards off the tee. 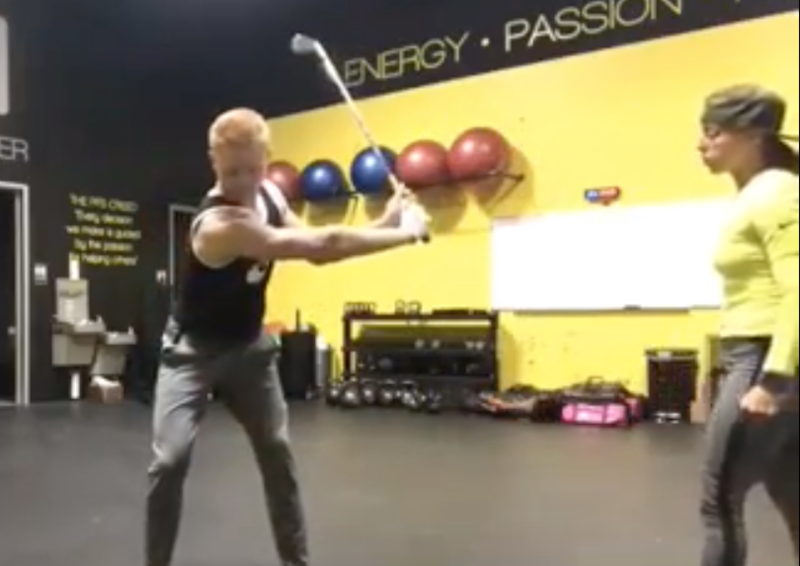 Because many golfers choose to play after years of sitting at a desk, most people also need better power transfer from right to left at impact, but again many people lack stability or strength to get into their hips and don’t achieve good force production at impact. This inefficiency with power will cause a player to come over the top of the ball and the flight path can take a hard turn. Golfers tend to wear themselves into the ground by continuing to play with improper movement patterns, leading to hip and back problems. The exercises below are aimed at helping these common issues. With that said here are my top DVRT drills I choose to use with nearly all my players. There can be many reasons why a person has trouble at impact, but one such can be lack of mobility in the hips. These are the guys often complaining of back pain because their lower back/pelvis is being asked to rotate since their hips are not. *someone has to pick up the slack. Before you can rotate the hips you must be able to extend the hips. In DVRT we talk a lot about the 3 planes of motion and mastery in the sagittal plane is the first thing a person must have before the next 2 planes can be achieved. The glute bridge with pullover gets the three musketeers (glutes, core, lats) working together as a unit which is key for training proper and full hip extension. Creating that tension of gripping and pulling apart the Ultimate Sandbag is what helps develop that tension. These types of connections with make in DVRT enhance golf strength training to such a higher level because golf is all about making proper connections in the body! The flight path of the ball will change depending on the grip on your shaft and club face orientation. In this drill we change the holding position of the bag in order to elicit the proper response from the muscle tissue. When people are typically having lumbar issues we need to look both above and below this area to see what are the true culprits. After having already talked about the glutes and the need for proper hip extension in the sagittal plane. We should also be looking at the front of the body and see what the torso muscles are doing. Before one can rotate they need to stabilize against forces greater than gravity which is why you need to work anti-rotation before trying to express power. The stabilizers of the torso lend to better separation to pull the club into the back swing and then release all that stored energy after through the t-spine. An exercise is only great if we get an opportunity to teach the body how to connect to the chains, how to move smarter, and what weight brings in not just challenging our body but making it smarter. That’s why our #DVRT bird dog strength coach @joelgun10 works so well! The Ultimate #Sandbag connects our lats and core while the @perform_better mini band makes us engage our core from the ground up! Best of all this teaches the full chain of pat, core, and glutes also known as our Posterior Oblique System. As Joel explains…. —————— #Repost @joelgun10 ・・・ How do you activate your #core? Bird dogs is a great core exercise! But… Are are you doing it in a way to not only “activate” your core, but to also build strength and correct form? Using #DVRT methods to connect the chains. Using the Ultimate Sandbag and mini-band to not only add load, but to give feedback. ✔️Screwing and gripping the hand into the floor, activating my lats and connecting my shoulder hips and pelvis, creating the perfect plank though my thoracic and lumbar spine. ✔️Push my feel into the ground, creating tension from the ground up. From my toes, to my pelvis/glues, to my lats/shoulders, to my hands and fingers. ✔️Dragging the USB, not lifting the bag, and using the mini-band to connect the body. Dragging the bag and creating tension through the lats through the core. Using the mini-bass to pull and push with the lower body, activating the glutes and hamstrings. Staying on the ground would allow me to create better ground force but if I need the athlete or client to understand how not to cheat this anti-rotational drill, I simply ask them to elevate the knees. This makes them connect the feet way more intentionally into the floor and immediately gives them feedback when they remove a hand and foot to pull the bag through. The tall kneeling pressout allows the pelvis to be more visible for proper hip extension while the limbs move the bag away from the body. Removing my ankles and kneeling causes the torso stabilizers to kick in greater than if I was standing on my feet. Then adding the arc pressout from a half kneeling will highlight more frontal plane mechanics necessary to resist rotation. As most golfers know the majority of what dictates hitting a shot straight and long is the path of the club face through the impact zone. If your hips slide backwards and forwards your impact zone moves with your hips so that is where having a lot of lateral stability especially is so important. Having the right ankle and leg as the trail leg forces someone to own stability in the lead leg (in this case Brians left) then as he descends down we add some torso rotation (with the Ultimate Sandbag in the shouldered position) into that lead leg which allows his inside thigh to hold the pelvis in position furthering his strength in the internal rotators of the hip. The opposite shoulder being loaded ensures his oblique’s remain active participants and further connects the posterior oblique sling. All this helps with truly getting that x factor and proper kinematic sequencing. both these DVRT strength training movements help us teach valuable concepts of better movement and strength! Adding the core strap to create a greater lateral force is how I can make this drill progressively more challenging. The ultimate expression of athleticism is not just rotation but power transfer from left to right or right to left as it relates to being a rotational athlete and human. max lunge=it teaches clients how to maintain stability while resisting frontal and transverse plane forces. There is a reflexive core stability response as the Ultimate Sandbag is moved from side to side, not to mention the sand shifting which makes for a constant variability with each rep. Most people don’t realize that a MAX Lunge can be regressed to many levels and that is why our strength training helps so many people because we can meet people where they are at! These DVRT drill will improve your body’s ability to get into a quality address position. It will help you maintain balance, improve your stability and mobility, and increase your ability to store and release energy elastically.